Abby Brunty of Crawfordsville (left) is a sixth grader at Granville Wells. Ali Hieston of New Ross is a freshman at Southmont. If you are on Facebook at all then you’ve probably seen the many dance videos spreading like wildfire of local dancers, dancing away at several recognizable locations including, The Paper of Montgomery County! Talent Factory Arts & Dance (TFAD) look for unique ways to celebrate National Dance Day each year and this year did not disappoint when TFAD launched its “Bust a Movement Challenge.” Owners, Jim and Paula Kochert challenged their dancers to go out and spread happiness through the art of dance. Challenge participants had to take videos of themselves doing a dance move in different locations and post the videos on Facebook and Instagram. “We decided to do this to get kids out . . . to get our dancers up and moving before dance classes start. This encourages families to get out and plan on how they were going to do this challenge together. Parents had to go with their kids to drive them around at the different locations . . . getting families to interact with one another,” Kochert said. She spoke as to how social media has become such a huge part of people’s lives and that with this challenge the kids and parents alike get their “social media fix” and everyone can participate at any skill level. The challenge encourages families to interact and spend time together. Kochert said, “Talent Factory is all about family.” This mantra shows in how she and husband Jim run their business. Her children, daughter’s Madeline and Marigrace have both been involved in Talent Factory as well as the couple’s grandchildren. 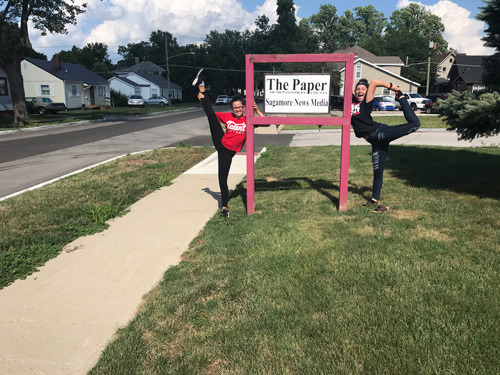 Two Montgomery County participants, Abby Brunty and Ali Hieston recently brought their love of dance to The Paper of Montgomery County. Along with many other locations the young dancers danced in front of our offices inspiring fun and bringing smiles to those around them. Kochert expressed how proud she was of Hieston and of all their participants. Saying, they had no idea when this started just how big it would get! Talent factory is located in downtown Lebanon and is open to all skill levels and abilities.